Midnight snacks are simultaneously incredible and horrible. I say horrible because, well, lets face it they are terrible for you. Normally midnight snacks are salty, fatty, cheesy, gooey, and all around sinfully amazing. Although eating less than 2 hours before sleeping is technically not a great idea, I personally do not have enough self control to not binge eat while late-night studying or Scandal marathoning for the 10th time. Whenever my sister was home from college, she would stay up late with me watching cooking videos on youtube or The Office on Netflix and our midnight snacks would be boxed mac & cheese. Sometimes we would switch it up and add in our own slices of american cheese instead of the boxed cheese, but those were reserved for the ~~fancy~~ nights. Thankfully, we stopped buying boxed mac & cheese and had to become a little more inventive with our midnight snacks. I came across this meal idea one night when I was craving pasta but didn’t have the 20 minutes it would take to boil the water/cook the pasta. My cousins, who I made this midnight snack/quick meal for as well, described it as “pesto pasta without the pesto or pasta”. If a dish has flavorful seasoning and enough fresh vegetables to complement the meat, then there is no need for the added carbs in the pasta and the excess salt in store bought sauces! 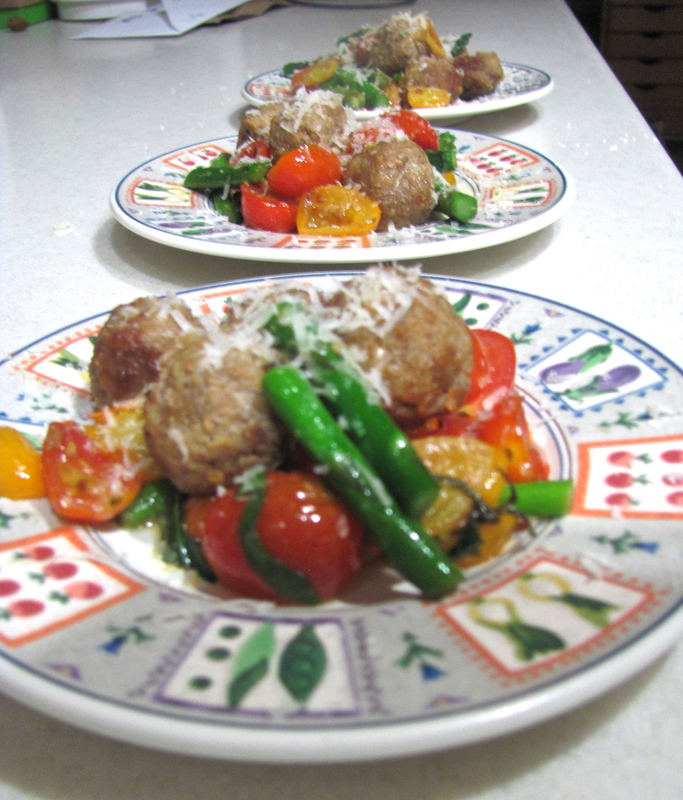 The basic dish is really simple, frozen meatballs (mine are from Trader Joe’s and are turkey meat balls), tomatoes, and any left over vegetables you have on hand. We always have frozen turkey meat balls on hand to bulk up and add protein to any dish, and I added in some fresh basil (dried will work too), parmesan cheese, and olive oil (used for cooking oil) to feign a pesto flavor without breaking out the food processor. It wasn’t until I was almost done with the dish when I decided that I wanted fresh basil, so at 1 AM I quietly snuck outside and maneuvered through the garden barefoot to pick some fresh basil leaves. Of course I was too lazy to find a flashlight or turn the light on outside, so I was blindly stumbling around and felt like some sort of sad thief. It was like sneaking out for the unadventurous (lame) type. This midnight snack took less than 10 minutes and was so good I made it again for lunch the next day. One of my cousins was hilariously in awe of how this filled him up without making him “feel gross”, so this really does make for the perfect midnight snack, quick lunch, or light and healthy dinner. Place a small pot of water to boil. Meanwhile, microwave the frozen meatballs for ~1-1.5 minutes until no longer frozen and cut tomatoes, asparagus, and basil. 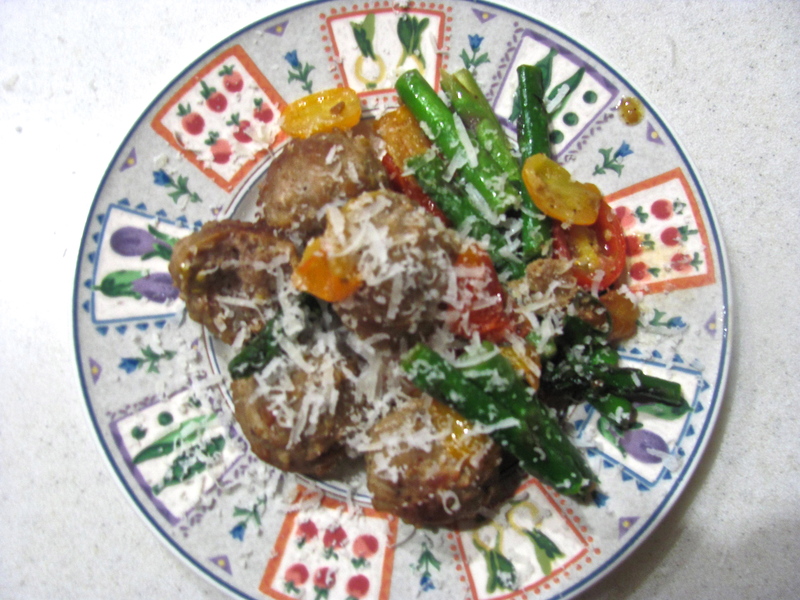 Heat some olive oil in a small pan and place meatballs and tomatoes. 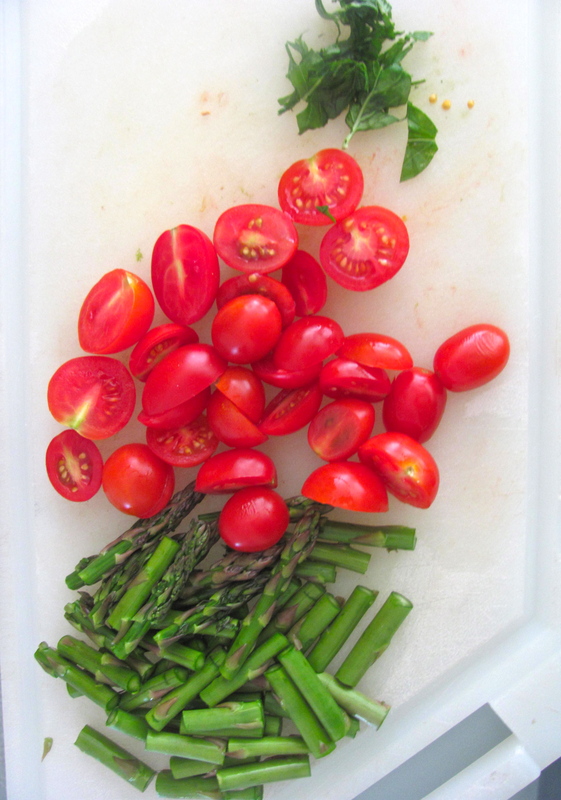 The cooking time is flexible, about as long as it takes for the water to boil and asparagus to cook. Once water is boiling, salt the water and add asparagus. 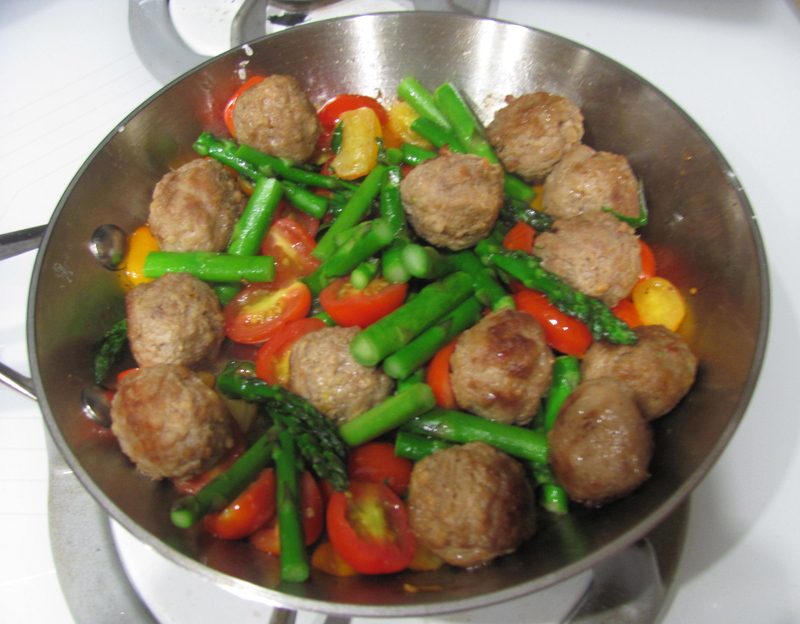 After ~3 minutes or when the asparagus is bright green, add to the meatballs and tomatoes. Add the basil and salt & pepper to taste. Plate and sprinkle parmesan cheese on top.